Since Alexander II ascended to the Russian throne in 1855 and implemented a series of modernizing reforms, including the emancipation of the serfs in 1861, Russia has found itself in the throes of continuous upheaval, caught between the autocratic traditions of empire and the dawn of the modern era. As the advent of industrialization and two world wars thrust Russia onto the global stage, the ramifications of its tumultuous history have been felt throughout the western world. This unique resource presents and evaluates ten of the most critical events in modern Russian history from the pivotal years of 1855-1991, including the Russian Industrial Revolution, the fall of the monarchy, the Stalin era, the Cold War, and the collapse of the Soviet Union in 1991. A full chapter is devoted to each event, and each chapter includes a factual introduction to the event, as well as an in-depth interpretative essay exploring its underlying causes, factors, and effects. Coverage for each event also includes an annotated bibliography of works suitable for students and an illustration for each. A glossary of terms, a timeline of Russian history from 1853-2004, a list of Russian/Soviet rulers and a population chart serve as ready reference materials for students looking to understand this critical period in world history. Since Alexander II ascended to the Russian throne in 1855 and implemented a series of modernizing reforms, including the emancipation of the serfs in 1861, Russia has found itself in the throes of continuous upheaval, caught between the autocratic traditions of empire and the dawn of the modern era. As the advent of industrialization and two world wars thrust Russia onto the global stage, the ramifications of its tumultuous history have been felt throughout the western world. 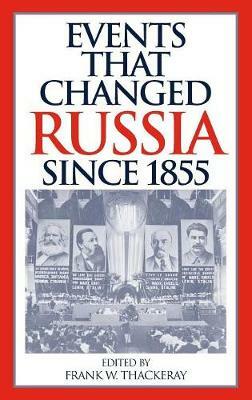 This unique resource presents and evaluates ten of the most critical events in modern Russian history from the pivotal years of 1855-1991, including the Russian Industrial Revolution, the fall of the monarchy, the Stalin era, the Cold War, and the collapse of the Soviet Union in 1991. A full chapter is devoted to each event, and each chapter includes a factual introduction to the event, as well as an in-depth interpretative essay exploring its underlying causes, factors, and effects. Coverage for each event also includes an annotated bibliography of works suitable for students and an illustration for each. A glossary of terms, a timeline of Russian history from 1853-2004, a list of Russian/Soviet rulers and a population chart serve as ready reference materials for students looking to understand this critical period in world history.